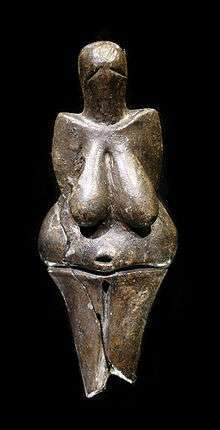 Ceramic art is art made from ceramic materials (including clay), which may take forms including art ware, tile, figurines, sculpture, and tableware. 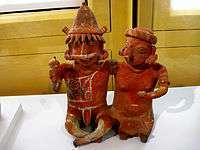 Ceramic art is one of the arts, particularly one of the visual arts, and of those, it is one of the plastic arts. 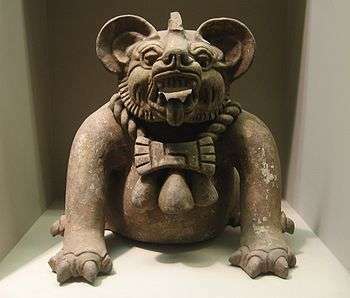 While some ceramics are considered fine art, some are considered to be decorative, industrial or applied art objects. 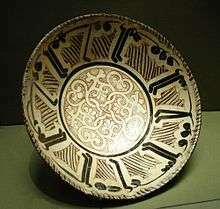 Ceramics may also be considered artefacts in archaeology. 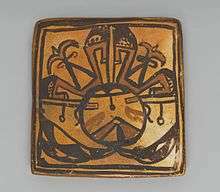 Ceramic art can be made by one person or by a group of people. 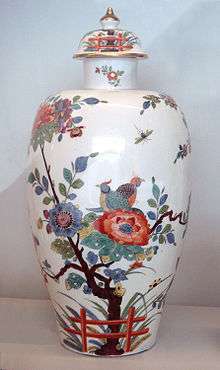 In a pottery or ceramic factory, a group of people design, manufacture and decorate the art ware. 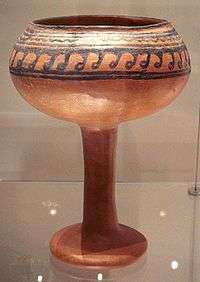 Products from a pottery are sometimes referred to as "art pottery." 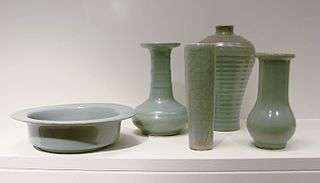 In a one-person pottery studio, ceramists or potters produce studio pottery. 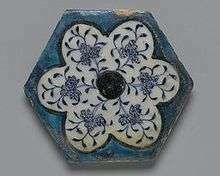 Glazed Egyptian faience goes back to the third millennium BCE, with painted but unglazed pottery developed even earlier in the Naqada culture. 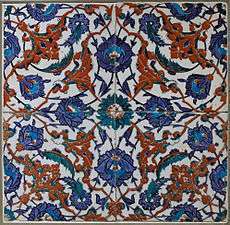 Faience became sophisticated and produced on a large scale, using moulds as well modelling, and later also throwing on the wheel. 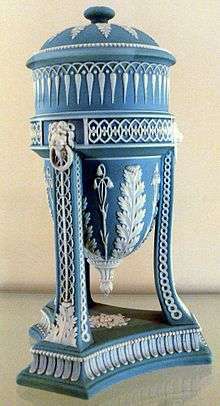 Several methods of glazing were developed, but colours remained largely limited to a range in the blue-green spectrum. 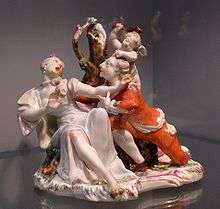 Based on the parallel (independent from Böttgers invention 1708, Dresden) invention of porcelain by D. I. Winogradow in St. Petersburg a porcelain manufacture was founded in 1744. .
1 2 Boaretto, E.; et al. (2009). "Radiocarbon dating of charcoal and bone collagen associated with early pottery at Yuchanyan Cave, Hunan Province, China". Proceedings of the National Academy of Sciences. 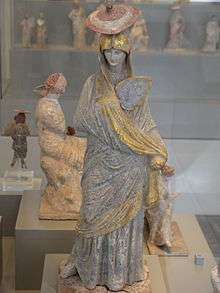 106 (24): 9537–9538. Bibcode:2009PNAS..106.9595B. doi:10.1073/pnas.0900539106. 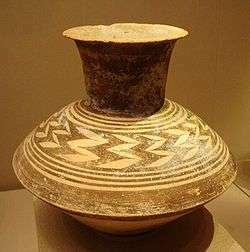 1 2 "Harvard, BU researchers find evidence of 20,000-year-old pottery". Boston.com. 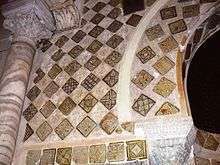 ↑ "Qantara – Mihrāb of the Great Mosque of Kairouan". qantara-med.org. Retrieved 19 March 2016. ↑ "all about Stoke-on-Trent in 5 minutes...". 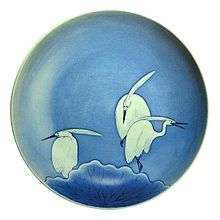 thepotteries.org. Retrieved 19 March 2016. 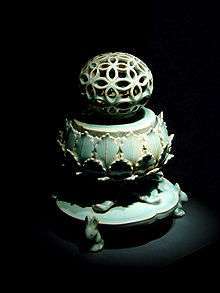 ↑ "Palace Museum Opens Its New Porcelain Hall". chinaculture.org. Retrieved 19 March 2016.